I always used to think that poker was just a game of cards, and I have to admit it never occurred to me that people actually played poker for anything but fun. 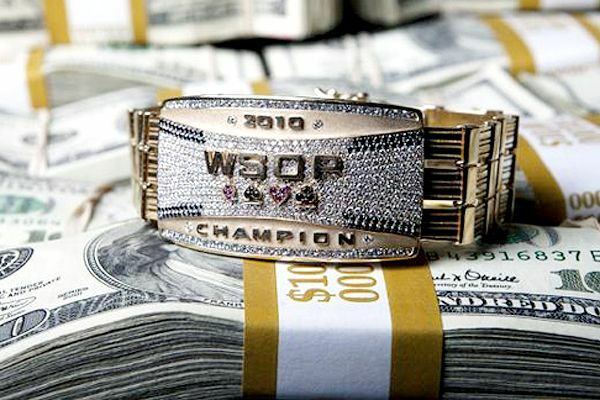 So imagine my amazement when I learned recently that players in the World Series of Poker this year are competing to win one of 60 standard bracelets and a Main Event bracelet. Yes, that's right - bracelets! Pieces of jewelry! Who'd have thought it?! Since it began in 1970, the WSOP has become the poker world’s longest running tournament. Bracelets have been awarded as prizes since 1976 and the very first bracelet - which was said to look like flattened gold nuggets - cost around $500. 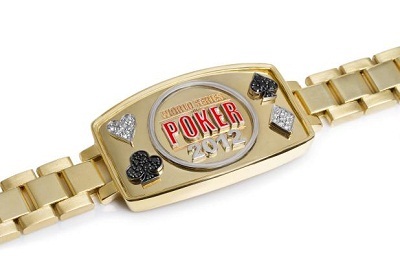 During the 1980's a Las Vegas jeweler, Mordechai Yerushalmi, became the exclusive manufacturer of WSOP bracelets, although the design was still somewhat unremarkable and featured a relatively flat plate engraved with the event and the players name. It was not until around the time of the poker boom that the bracelets began to really change in design and become more elaborate. In 2005, Gold and Diamond International designed the bracelets, accenting them with diamonds to add to their intrinsic value. Frederick Goldman, Inc. designed the 2006 bracelets, and the Main Event bracelet had 259 stones with 7.2 carats of diamonds as well as 120 grams of gold! 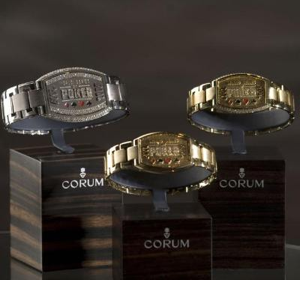 From 2007 to 2009, Corum was the official designer and the bracelets by and large resembled a wide faced watch. 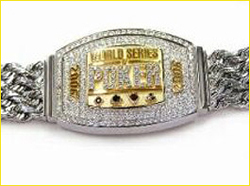 In 2007, the standard bracelets were typically valued at around $1,500 in value, but the Main Event bracelet was probably worth around $30,000. The design of the Main Event bracelets continued to became even more impressive. The 2008 bracelet had 291 diamonds weighing a combined 2.81 carats. On Tilt Designs Pty Ltd designed bracelets starting in 2010, and adopted a somewhat retro look for the standard bracelets reflecting On Tilt's desire to create a design that players would wear everyday. 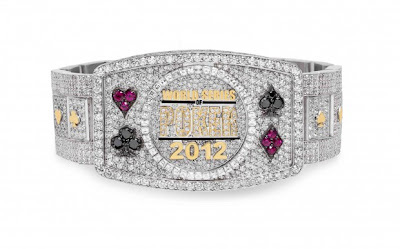 Jason of Beverly Hills designed this year's 2012 WSOP bracelets, and the Main Event bracelet (see below) is most stunning of them all. Set in 170 grams of 14 karat gold with 35 carats of diamonds, it is worth more than all this year's other 60 standard bracelets combined, and easily the most valuable bracelet in the history of the event. "The epitome of Vegas says 'over the top,' and that's what I did here," said Jason Arasheben, president of Jason of Beverly Hills, describing his design when it was unveiled earlier this year. The WSOP bracelet is a symbol of poker excellence and a trophy that every poker player aspires to. As the bracelet has evolved, the symbolic value has been enhanced by pieces that have real world value and will surely become keepsakes for the player's and their families for a lifetime. If it wasn't for the fact that I have a very expressive face (and couldn't win an argument, never mind a game of poker) I'd be tempted to take up the game! How about you?